From the late 1950’s to 1960’s, poems were more likely to be autobiographical and personal, majorly addressing poets’ personal feelings about a lot of shameful and negative matters, known as the confessional style. Meanwhile, poetic themes were more special, such as abortion, suicide, alcoholism, etc. There were several prominent confessional poets, Theodore Roethke, Robert Lowell, Anne Sexton, Sylvia Plath and W.D. Snodgrass. All of the confessional poets stayed out of the standards for socially accepted topics. Among them, Robert Lowell is the most successful poet, not only leading the new ways in autobiography but also representing the sensibility in American poetry. For instance, Lowell’s Life Studies made a significant breakthrough to a new style in poetry realm which M.L Rosenthal called “confessional”. 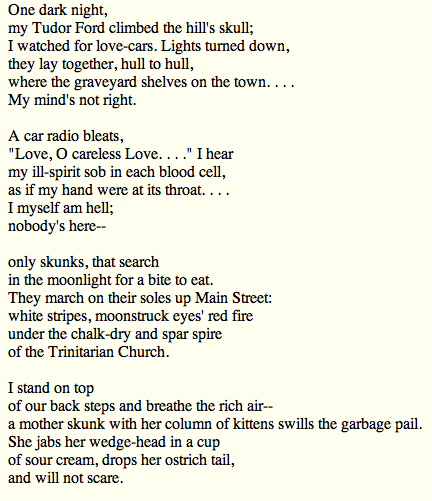 Moreover, “Skunk Hour”, the final poem in Life Studies, is one of the most famous poems that shows what confessional poetry is like. 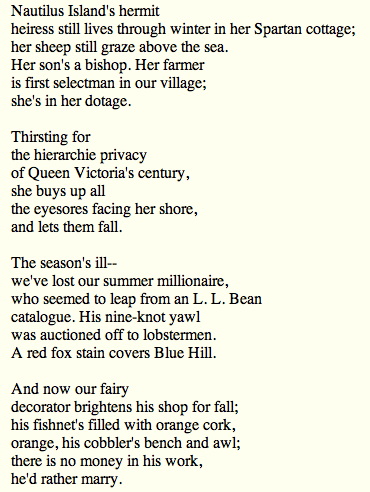 In the Skunk Hour, “the confessional mirroring of public and private is expressed formally in the poem's symmetrical division into four stanzas about the social environment and four about the poet's "dark night" of voyeurism and incipient madness.” The poem begins with the speaker reflecting on a coastal town in Maine and later describes a wealthy woman who seems to own a lot of money, but is alone “in her dotage”. Moreover, he depicts many things that are going wrong with the place. Through saying, “we’ve lost our summer millionaire” and “a cobbler’s bench and awl”, Lowell is illustrating a pretty sad scene for the whole place. 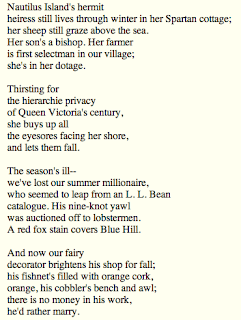 In the next four stanzas, the attention is shifted to the poet himself. He remembers the drive he took through the town was gloomy and he admits to being depressed and feeling crazy. The emotional effects and mental illustrations he has are expressed deeper and deeper as the poem progresses. I feel like the poet is very frustrated of the emptiness and futility of the American civilization and of what he sees around his society. 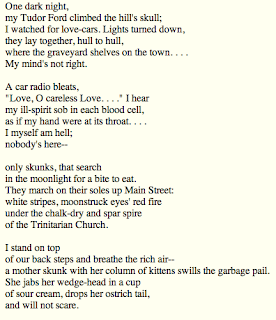 Nevertheless, the poem moves from the frustration to the individual revitalization when he sees the mother skunk and its kittens rummaging the garbage for the leftover in order for survival. Through the poem Skunk Hour, we can see the confessional poetry is basically writing memoirs about overcoming traumatic experiences and mental illnesses. 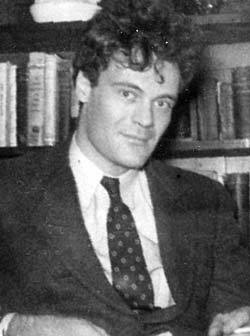 In essence, Robert Lowell is the leading figure of confessional poetry, later followed by poets like Anne Sexton, Sylvia Plath, and so on.